The cash-strapped U.S. Postal Service is launching a new line of apparel and accessories under the brand name "Rain Heat & Snow," playing off USPS' unofficial motto "Neither snow nor rain nor heat nor gloom of night stay these couriers from the swift completion of their appointed rounds." Do you look like a hot mess? Not anymore, thanks to the Fabulousmaster General. Pick up a sequined slate-blue minidress with peek-a-boo hiking heels and matching messenger bag. I’ll be working some fierce jeggings and a retro-logo jacket matched with an ironic pith helmet. Look out Paris and Milan! I’m such a skeptic. 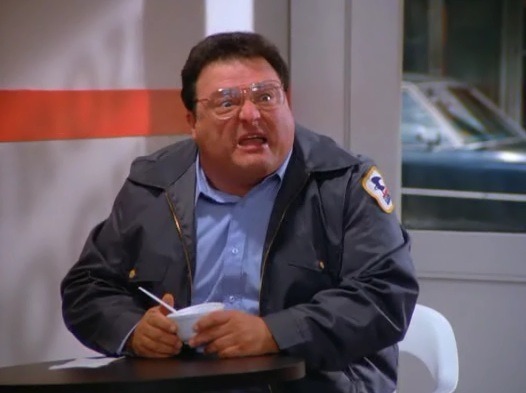 Maybe USPS polls show that kids revere Seinfeld’s Newman as their sartorial lodestar. Perhaps hordes of teenage mallrats and fashion-forward DJs are chomping at the bit to buy all the prêt-à-postal merch that Chinese factories can sew up and spit out. Why couldn’t Katy Perry wear bedazzled letter-carrier cullottes in her next video? The financial troubles with the Postal Service aren’t going to be fixed by a penny stamp increase, removing weekend delivery, or, heaven forbid, a fashion line. Their problem is far deeper than that. Where there is no competition, everyone suffers. The customer pays higher prices for worse service while innovation atrophies. Interestingly, the USPS is doing pretty well in package delivery – the one area where they have plenty of competition from other delivery giants. Where they are losing the most money is first-class mail. One would think that a monopoly guarantees success, but as shown by Amtrak, this is rarely the case. Instead of incremental changes that just delay the inevitable, it’s past time to consider privatizing the postal service. It would help long-suffering customers, taxpayers and the postal service itself.